Morocco winger Oussama Assaidi believes the national team needs a foreign coach and a new attitude. The Atlas Lions failed to qualify for this year's World Cup in Brazil and are without a permanent coach. Former U20 manager Hassan Benabicha, who was placed in charge after Rashid Taoussi was sacked last year, remains the interim solution. "I think first they have to find a good coach - not a Moroccan coach, but one from outside," Assaidi said. FC Sochaux boss Herve Renard, who coached Zambia to the 2012 Africa Cup of Nations title, has been linked with the job. But Assaidi realises there is more wrong with Morocco than just the lack of an experienced coach. "We have very good players but yet we are not a good team. We have to be more of a team not everyone just playing for themselves," he said. Morocco's recent record does not make for happy reading. As well as missing out on Brazil, they have failed to get past the first round in their last four appearances at the Nations Cup - and in 2010 they did not even qualify. It is now 10 years since they finished as Nations Cup runners-up and 38 years since they won the tournament. They will host the tournament in 2015 and the country's supporters will be expecting the team to make them proud. Assaidi has called for the players to show togetherness and unity. "We have to play for the country and we have to be a team and then we can do well," he said. 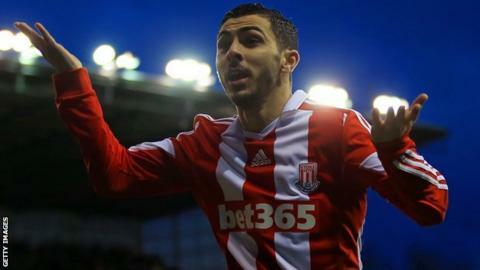 Meanwhile, Assaidi is cautious about his prospects of returning from injury and admitted he was concerned about coming back too soon. "It is very difficult for me because it is the first time that I have a knee injury," said the 25-year-old, who has scored four times for Stoke since joining on loan from Liverpool at the start of the season. "I hope to be back fast and to play some games before the end of the season. I don't want to take a big risk with my knee because my knee is very difficult injury. "We will see, hopefully I will play a couple of games before the end."